Street lighting has been a big issue locally of late, as covered in The Press, and in oneandother.com – which records that this is ‘the biggest overhaul of streetlights in York since the Victorian era’. 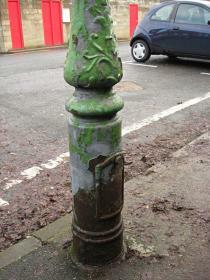 So I have a reason to include a couple of images from my ‘photos of old (possibly Victorian) lamp posts’ collection. Well, ‘collection’ is too grand a word for it, but I did notice that new lights were being put in, in the Clifton area, and that they were clearly replacing some antique structures, which had been (rather dimly, it has to be said) lighting our way for some time, so I took a few photos. 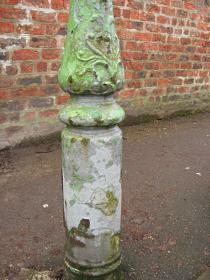 These rather ornate street lamps I’d admired in a vague way for some years, in passing. Mainly after joining a Flickr group of rust enthusiasts. Were these rusty enough? Probably not, but photogenic in their own way, and clearly not of our times, being unnecessarily ornate. I loved that peeling green-grey-rusty mix. I suppose they’re Victorian/Edwardian. There are I think one or two similar examples in streets off Bootham/Clifton, though the example pictured has gone. The surviving ones will probably be replaced also, as I think they’re beyond the boundary of the Conservation Area. 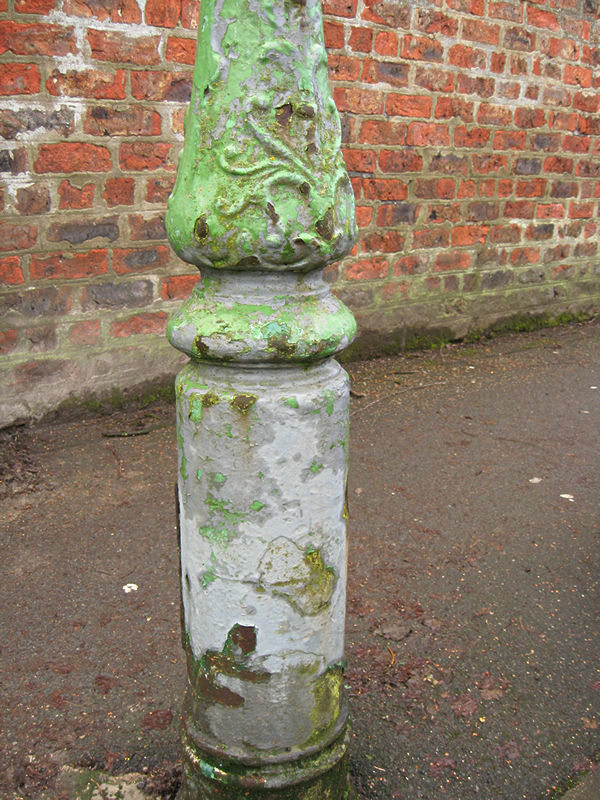 When it became clear these old street light columns were being made redundant, I thought about making enquiries about where they were heading, as I’ve seen similar cast iron antique examples looking rather stylish in people’s gardens, and thought I could adopt one. But no doubt gone are the days when you can just wander up to a workman and say ‘Do you want that?’ ‘Can I have it?’ and they’d be glad to have it off their hands. And I couldn’t quite see myself heading off down the street dragging a whole cast iron lamp post. They’re quite heavy, and it would be really embarrassing to try to claim it and then to set off with it and not be able to move at all. The replacements are far more effective in helping you to see where you’re going, so I’m not complaining. Merely noting the twiddly loveliness of structures once useful and now redundant. And can’t help reflecting on how many people’s night-time walks they lit, like Stephen’s, maybe. 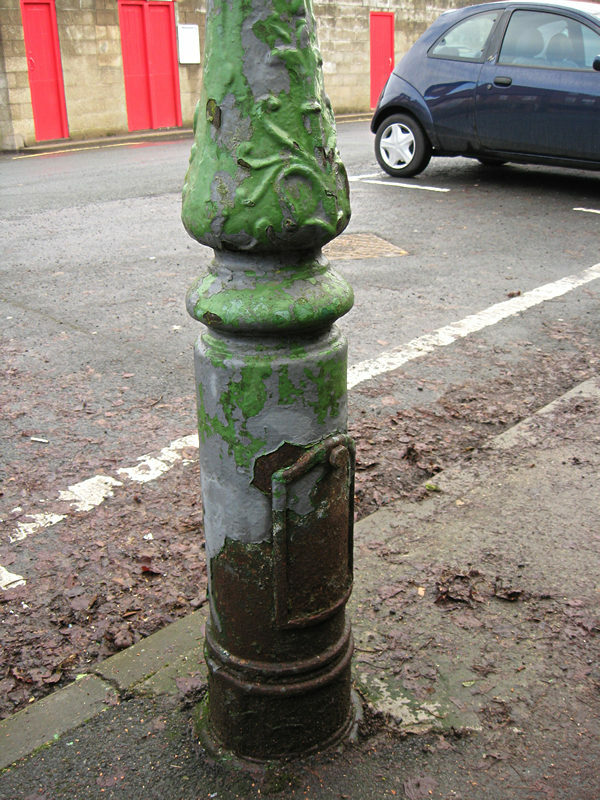 By Lisa @YorkStories • 16 April 2012 Details, Streetscape To link to this page's proper location please use the > permalink.